#1: Six persons on Saturday were wounded when an improvised explosive device (IED) went off in the capital Baghdad, according to a police source. “The explosion, which occurred in al-Zafaraniya area, southeastern Baghdad, targeted a police patrol vehicle, wounding six persons, including three patrolmen,” the source told Aswat al-Iraq news agency. #2: A roadside bomb wounded two civilians when it exploded as a police patrol was passing in Baghdad's southern district of Doura on Saturday, police said. #3: Around 6:30 p.m. a parked car bomb exploded in Mansour neighborhood killing police Lt. Col. Ahmed Ghazi, as he was passing by driving his civilian car, and one civilian and injuring nine. #1: Around 11:15 a.m. a booby-trapped parked bicycle exploded targeting an American military convoy in Baquba city. One Iraqi civilian was injured. #1: An unknown corpse on Saturday was found near Makhmour district, according to a military source. “Today, an army force found an unknown body belonging to a young man in his thirties in a hole on the main road between Makhmour district and al-Qayara near Alawa Mahmoud village (25 km west of Makhmour),” the source told Aswat al-Iraq news agency.“The body bore signs of gunshot wounds,” the source noted. #1: One civilian on Saturday was wounded when an improvised explosive device (IED) detonated in downtown Mosul city, according to a police source. “The explosion occurred in Bab Lakash area, downtown Mosul, and targeted a police patrol vehicle,” the source told Aswat al-Iraq news agency. #1: Two quick-thinking naval medics have been praised for catching a bomb-maker INSIDE a British Army base in Afghanistan. Sgt Ian McGleish and medical assistant Jayne Gibbons, 27, were taking an injured Afghan to hospital at Camp Bastion in Helmand Province when they spotted wires sticking out of his pockets. After a search they also found batteries, electrodes and circuits for explosives. The man, with shotgun wounds, was then handed over to investigators. Army Sgt. Robert Stucki a member of the 194th Military Police Co. out of Fort Campbell, he was the truck commander in a convoy leaving Fallujah when he saw something thrown toward his truck. The small "thing" was a grenade, and it packed a punch. and the thing passed between my legs." Then with a glance at his legs — both intact — he said all he needed was "a few surgeries with plates and screws." Lance Cpl. Jose Gasca became a United States Citizen Friday, five months after losing his legs during combat. MNF-Iraq is reporting the death of a Multi-National Division - Baghdad soldier from combat related injuries in an undisclosed neighborhood of Baghdad on Thursday, February 28th. The Washington Post is reporting the death of an ISAF soldier from an explosion in Zabul province, Afghanistan on Thursday, February 28th. At this time NATO has retracted their release. The AP is reporting that a Romanian soldier, Sergeant Maj. Claudiu Chira, was killed in an IED strike between the cities of Kabul and Qalat. Here's the translated Romanian MoD statement. Enemy fire downed copters in crash that killed Drum soldiers: Military officials now say the fatal crash of two Army helicopters in Iraq last month was caused by enemy fire. The Defense Department initially said the cause of the Jan. 26 crash near Kirkuk didn't appear to be the result of an attack. But on Thursday, Army officials at Fort Drum, where the pilots were based, said the crash occurred as the OH-58D Kiowa Warrior helicopters were evading enemy fire. An Army report says forensic evidence revealed that enemy fire led to the crash. #1: Security forces on Friday found an unknown body in Diala province, according to an official security source. “Security forces on Friday found a body of a young man, between 25 and 30 years old, near Hamrien village in south of al-Saadiya district in Diala,” the source told Aswat al-Iraq news agency. #1: The al-Zahraa hospital morgue on Friday received the body of an unidentified civilian man after being salvaged from a river in the northern part of the province, a morgue medic said. “The body, which was salvaged from a river in the district of al-Suwayra, (135 km) north of al-Kut, showed signs of having been tortured,” the source told Aswat al-Iraq news agency. #1: Two police officers were killed when a bomb set with a police convoy as its target exploded in the southern city of Kut. #1: A Hummer vehicle was damaged when an improvised explosive device (IED) went off near a U.S. convoy north of the city of al-Amara but left no casualties, a source from the Missan police department said on Friday. “The IED went off as the U.S. convoy was passing by al-Batira road, near the Missan international stadium, (5 km) north of Amara, damaging a Hummer vehicle,” the source told Aswat al-Iraq news agency. “The explosion did not leave any casualties,” the source added, not revealing further details about the incident. #1: The Multinational forces in southern Iraq said on Friday that a convoy came under a roadside bomb explosion in central Basra, damaging an armored vehicle. “An explosive charge went off targeting a convoy of the Multinational forces near al-Fayhaa hospital in central Basra, damaging one of the convoy’s vehicles,” the media spokesman for the MNF, Bill Young, told Aswat al-Iraq news agency. “The blast left no casualties,” he noted. #1: Two sahwa (Awakening) tribal fighters were killed and two others wounded by unidentified gunmen fire in al-Huweija district on Friday, a senior security source said. “Unidentified gunmen opened fire at a checkpoint of the sahwa forces in al-Askari neighborhood, al-Huweija district, (65 km) southwest of Kirkuk, leaving two fighters killed and two others wounded,” Brig. Sarhad Qader, the Kirkuk Districts’ Police Department chief, told Aswat al-Iraq news agency. #1: In Mosul, gunmen shot and killed a literature professor at a cultural center. #2: An Iraqi army officer and soldier were wounded in an improvised explosive device (IED) attack in western Mosul city on Thursday, a police source in Ninewa said. “An IED went off near al-Siha tunnel, western Mosul, targeting an Iraqi army patrol. The blast left an officer in the rank of major and a patrolman wounded,” the source told Aswat al-Iraq news agency. #3: Meanwhile, another security source said the police on Friday found an unidentified body drifted by rainwater to an area between the predominantly Christian area of Talsaqaf and Seriksha compound in Talkeef district, (30 km) north of Mosul. “The body, of a 50-year-old man, showed signs of having been shot,” the source added. #1: About 20 Kurdish militants have died in internecine clashes between rival rebel factions based in northern Iraq, a Turkish military spokesman was quoted as saying Friday. Two feuding groups within the Kurdistan Workers' Party, or PKK, clashed Feb. 13 after one of them killed three defectors, Gen. Metin Gurak told the Anatolia news agency. "It has been learned from various sources that about 20 terrorists were killed and 20 others wounded as a result of the fighting," he said. The clashes prompted other defections. The army also had information of a second incident of deadly infighting in another area of northern Iraq last week between a group of PKK militants who wanted to surrender and others who tried to stop them, Gurak said. #1: About 500 protesters blocked roads and clashed with police in southern Afghanistan on Friday, alleging international forces fired gunshots in a village mosque. A spokesman for NATO forces said they had no reports of international troops in the area where Thursday's incident allegedly occurred. protester reached by phone said he saw Polish forces fire their guns in a mosque in the village of Dhi Khodaidad in Ghazni province. Adulrahman, who only gave one name, said he was in the mosque when the troops raided the building. He said the bullets hit a wall but did not injure anyone. Six people were hurt on Friday when Afghan police fired on demonstrators who claimed U.S.-led troops had desecrated copies of the Koran during a raid on a mosque in Ghazni province southwest of Kabul, residents said. #2: A roadside bomb hit a NATO-led force convoy in southeastern Paktika, wounding two soldiers of the organisation, a provincial official said on Friday. #3: Unknown armed men kidnapped two Afghan aid workers in southern Zabul province on Thursday, a provincial official said. #4: Gunmen attacked a minivan transporting children to school in Pakistan's troubled North West Frontier Province on Friday, killing its driver and leaving two students wounded, police said. Five other students were kidnapped by the attackers who ambushed the vehicle on the periphery of Hangu, a remote town adjoining the lawless tribal region along the Afghan border. #5: Unknown people attacked the vehicle of Pakistan's Defense Minister Ahmed Mukhtar on Friday, local media reported. The vehicle was attacked in the garrison city of Rawalpindi near Islamabad, but heavy contingent of police succeeded in rescuing the minister, private Geo TV channel said. Marine Lance Corporal John T. Doody was shot by a sniper and paralyzed by a subsequent infection. The anoxic brain injury left him blind and paralyzed from the neck down and in a vegetative state from January 2008 until he started talking at the end of April. The doctors in San Diego, where he suffered his brain injury, gave us no hope and said that John should go to a nursing home. Sgt. Matthew Gibbons suffered injuries to his face and upper body after an attack, his father, Stephen Gibbons said. Special post for Thursday the 26th. 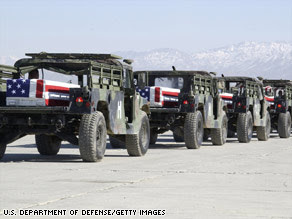 The Pentagon today lifted its ban on media coverage of coffins of war dead as they arrive at Dover Air Force Base in Delaware, Defense Secretary Robert Gates announced. The coverage must be approved by families. Advocates of opening the base to coverage say the unmarked, flag-draped coffins make it impossible to identify specific remains. The coverage must be approved by the victims' families, however. Advocates of opening the base to coverage say the unmarked coffins make it impossible to identify specific remains. Defense Secretary Robert Gates is to announce the change at a news conference at 2 p.m. ET, the senior official said. He ordered a review after President Obama asked for more information on the long-standing policy. The British MoD is reporting the death of a British ISAF Marine at the Selly Oak Hospital, Birmingham, England on Monday, February 23rd, from an enemy fire attack near Sangin, Helmand province, Afghanistan on Wednesday, February 25th. UK acknowledges 2 rendition cases: Britain's government has acknowledged that two terror suspects captured by UK troops in Iraq were later transferred by the United States to Afghanistan. #1: Iraqi officials say two Iraqi soldiers have been killed and 12 other people wounded in a roadside bombing in Baghdad. The officials say the morning blast struck an Iraqi army patrol near the University of Baghdad in the central part of the city. Police and hospital officials say the 12 wounded included two soldiers but most of the others were students. #2: Three civilians were wounded on Thursday afternoon in a bomb explosion, the second today in Baghdad, a police source said. “An improvised explosive device, planted by unknown gunmen on al-Nedal street in central Baghdad, went off on Thursday (Feb. 26), injuring three civilians,” the source told Aswat al-Iraq news agency. #1: An accidental explosion took place inside a house in southeastern Sulaimaniya, without causing casualties, a security source said on Thursday. “The explosion occurred in a house in Halabja district in southeastern Sulaimaniya,” the source told Aswat al-Iraq news agency. “The blast left no casualties,” he underlined. “Police opened an investigation on the incident,” he noted, without giving further details. #1: A roadside bomb targeting a police patrol in Karama neighborhood in Mosul killed an officer and left three other people wounded. #2: A roadside bomb targeting a police patrol in Wadi Hajar in Mosul wounded three people. #1: Two U.S. National Guard soldiers suffered minor injuries Wednesday in an improvised explosive device attack that signals the fighting season here may begin to escalate. Maj. Jason Wesbrock, Task Force White Currahee executive officer, said the attack came in a Paktika Province mountain pass where convoys were repeatedly attacked and ambushed last summer, though the area had fallen silent in recent months. The soldiers, who were in a Mine-Resistant Ambush-Protected vehicle and in a multi-vehicle convoy suffered only minor injuries, which Wesbrock described as concussion-like symptoms. Both were expected to survive. #2: A civilian was killed and five others were injured including 3 Afghan soldiers in a bomb explosion in Kandahar province. According to Kandahar police chief that the explosion was carried out by a remote detonated bomb, killing a civilian and injuring five others including 3 Afghan soldiers. #3: Hundreds of U.S. troops pushed into a key Taliban stronghold Wednesday in a major operation to stop the insurgents from infiltrating the Afghan capital from the south and clear the way for the first sustained international aid effort in this remote valley. Supported by about 200 Afghan soldiers and their French army trainers, 200 soldiers of the 3rd Brigade Combat Team of the 10th Mountain Division, based at Fort Drum, N.Y., encountered no resistance. The reactions to the arrival of the U.S.-led force Wednesday, however, ranged from skepticism to hostility. "Down To America" dabbed in whitewash greeted the U.S. column as it pushed into the valley from the American base in Maydan Shahr, the capital of Wardak Province. #4: A roadside bomb killed four Afghan security guards of a road construction firm on Thursday in southeastern Paktika province, the interior ministry said. #5: Four guards of a road construction company were killed in a mine explosion in Paktika province east of Afghanistan Thursday, spokesman of provincial administration Hamidullah Zawak said. "It was 11:30 a.m. local time when a mine planted by militants struck a car of the road construction company outside provincial capital Sharana killing four local guards," Zawak told Xinhua. Spc. Keith Maul, 20, was wounded in a grenade attack northwest of Baghdad on Feb. 17 is recovering at Walter Reed Army Medical Hospital in Washington, family members said. He lost an arm and a leg in the attack. A Pennsylvania National Guard spokesman identifies the solider as Sergeant Matthew Gibbons. The 2001 graduate of Altoona-Area High School sustained injuries to his face and his arms when a grenade exploded on Monday. Gibbon’s injuries are not life threatening, but the Harrisburg Patriot News reports that he lost an eye in the explosion. He’s currently recovering at a hospital in Germany. MNF-Iraq is reporting the death of a U.S. Soldier in a small arms fire attack in at an Iraqi Police station in Mosul, Ninewa Province on Monday, February 24th. An Iraqi interpreter was killed and three other soldier and an Iraqi interpreter were wounded in the attack. The British MoD is reporting the deaths of three British ISAF soldiers from an IED attack in the Gereshk district, Helmand province, Afghanistan on Wednesday, February 25th. No other details were released. Here's the official ISAF statement. Reports: Uzbekistan, NATO reach Afghanistan deal: Uzbekistan has reached an agreement with NATO allowing the alliance to send non-military supplies through the Central Asian nation en route to Afghanistan, news agencies quoted the Uzbek president as saying Wednesday. A U.S. military official last week said a tentative agreement had been reached, but there had been no confirmation until the statement by President Islam Karimov, which was reported by the Interfax and ITAR-Tass news agencies. Study Notes Brain Injuries To Fort Lewis Soldiers: A study conducted at Fort Lewis found mild traumatic brain injury in 15 percent to 25 percent of the soldiers deployed to Iraq or Afghanistan. #1: Security forces arrested 25 persons and defused eight roadside bombs in Baghdad during the last 24 hours, according to the official spokesperson of Baghdad Operations Command (BOC). #2: A roadside bomb targeted a police patrol in Illam neighborhood in southwest Baghdad around 7 p.m. Six people were wounded including two policemen. #1: Four civilians, including three oil company personnel, on Wednesday were kidnapped by unknown gunmen in southwestern Kirkuk, according to a local police chief. “This afternoon, unknown gunmen kidnapped four civilians, including three employees from the North Oil Company, while they were heading home in al-Rashad neighborhood (35 km southwest of Kirkuk city),” Brig. Sarhad Qadir told Aswat al-Iraq news agency. #1: Gunmen killed a prominent businessman after riddling him with bullets in his car in the northern city of Kirkuk, 250 km (155 miles) north of Baghdad, on Tuesday night, police said. #1: One civilian was wounded when gunmen launched an attack using grenades in central Mosul, a source from Ninewa police said on Wednesday. “The attack took place on the crowded al-Korneash street, central Mosul,” the source told Aswat al-Iraq news agency. “Gunmen threw three grenades during the attack,” he said. “The wounded civilian works as a lawyer,” he added. Gunmen threw a grenade at a police patrol at the Kornish street in downtown Mosul. Two people were wounded. #2: Police opened fire at a suspected suicide car bomber near a check point in Bashiqa in northeast of Mosul around 3:30 p.m. The car was detonated and the suicide bomber was killed. #3: Three mortar shells on Wednesday fell on a hospital in southeastern Mosul city, wounding one civilian, according a local police chief. “On Wednesday evening, three mortars targeted al-Salam Hospital, where the 2 nd division of the local police is stationed, in al-Wahda neighborhood, southeastern Mosul,” the official told Aswat al-Iraq news agency. “Two of the mortars landed inside the hospital’s perimeter, while a third landed in a nearby street,” the official explained, providing no further details. #1: Afghan National Army (ANA) backed by U.S.- led coalition forces killed 10 armed militants in Shaheed Hasas district of Uruzgan province in south of Afghanistan Tuesday, a joint press release of U.S. military and Afghan army said on Wednesday. "The combined elements were conducting a routine patrol when they came under small arms, mortar and fire from an unknown number of militants. The forces returned fire killing one militant," the press release said. #2: Afghan soldiers killed 18 militants targeting a poppy eradication force in the country's volatile south, officials said Wednesday. Two soldiers were also killed in the battle. The clash in the Nawa district of Helmand province broke out after insurgents fired on police working to rid the countryside of poppy plants, from which opium is made, said Daud Ahmadi, spokesman for the governor. Afghan and international soldiers were protecting the eradication force when it was attacked Tuesday, and two foreign soldiers were wounded in the exchange, said Ahmadi. He did not provide the soldiers' nationalities. Heavy fighting erupted in the neighbouring province of Helmand late Tuesday when gunmen attacked Afghan soldiers protecting police who were destroying illegal opium crops, the provincial government said. "Eighteen militants were killed and two Afghan army soldiers were martyred," provincial spokesman Daud Ahmadi told AFP. Two Westerners training the counternarcotics team were also wounded in fighting, he said. #3: In neighboring Kandahar province, meanwhile, a remote control bomb planted on a motorcycle exploded Wednesday in Kandahar city as a convoy of soldiers was passing, said army commander Sher Mohammad Zazai. Two Afghan bystanders were killed, and eight people — including five soldiers — were wounded, he said. In Kandahar city, explosives fixed to a motorbike were detonated remotely as an Afghan army convoy passed, said the regional army commander, General Shair Mohammad Zazai. Two civilians were killed and three wounded, while five Afghan soldiers were hurt, he told AFP. #4: Taliban insurgents opened fire on a foreign convoy killing several civilians in the Sangin district, some 490 (305 miles) southwest of Kabul on Monday, a joint statement by NATO and the Afghan governor's office said. #5: A father and three sons were shot dead by unknown gunmen in southwestern Pakistan on Tuesday night, local newspaper reported on Wednesday. Ghulab Shah, a hardware trader, was traveling home with his six sons when four gunmen ambushed his car on the high-security Sariab Road of Quetta, capital of Pakistan's Balochistan province, Daily Times newspaper quoted police as saying. Shah and three of his sons died instantly, while the other two were seriously injured. #6: Afghan troops and the NATO-led International Security Assistance Force (ISAF) launched operation against Taliban insurgents in Jalrez district of Afghanistan's central Wardak province, a statement of the alliance released here Wednesday said. "ISAF and Afghan National Security forces begun a joint operation against insurgents earlier today in Jalrez district of Central Wardak province," the statement said. This is the first offensive of the international troops launched in Wardak province over the past one year. Master Sgt. John Souza was wounded in Iraq and spending months at Walter Reed Medical Center in Washington D.C. Souza was injured after an I.E.D. exploded in an office he had been working in last June, during his second deployment to Iraq. "I did lose a fair amount of blood," he said. "I knew I was messed up because when I tried to get up I felt the leg just drop." Souza's left leg suffered the most damage. The explosion crushed and fractured several bones. He calls himself lucky, considering the other five people in the room did not survive. Robert Andrzejczak, 22, is currently recuperating at Walter Reed Army Medical Center in Washington, D.C., after loosing much of his left leg during an insurgent attack in Iraq. Winfrey visited Walter Reed. Specialist Jonathon N. James is recovering at Walter Reed Army Hospital in Washington from wounds he received in Afghanistan on Sept. 28, 2007. James suffered two penetrating shrapnel wounds to his left hand. The Washington Post is reporting the deaths of four U.S. led collation soldiers from a blast in an undisclosed location in Helmand province in southern Afghanistan, on Tuesday, February 24th. An Afghan civilian working with the military was also killed in the attack. Time: Can Pakistan Regain Control of Swat from the Taliban? #1: Eight people were injured including two national police members when two roadside bombs detonated targeting a patrol of the national police in Palestine Street in east Baghdad. #1: Three insurgents were killed when clashes broke out between a joint American and Iraqi forces and insurgents in one of the villages of Mandili town east of Baquba early morning. #1: An Air Force MQ-1 Predator unmanned aircraft stationed here crashed off base at approximately 4:30 p.m. local time Feb. 22. The Predator is a medium-altitude, long-endurance, remotely piloted aircraft used primarily to conduct armed reconnaissance. #1: A gunman was injured seriously while he was trying to plant a roadside bomb in Hawija town west of Kirkuk city on Monday evening. #1: Gunmen kidnapped a civilian near a church in downtown Kirkuk city on Monday evening. #1: Three policemen on Tuesday were wounded when a hand grenade went off in southern Mosul city, according to a local police source. “Last night, three National Police personnel were injured when a gunman threw a hand grenade at their patrol vehicle in al-Mansour neighborhood, southern Mosul,” the source told Aswat al-Iraq news agency. “The wounded were taken to a nearby hospital for treatment,” the source added, providing no further details. #2: Unknown gunmen on Tuesday threw a hand grenade near an office of the Patriotic Union of Kurdistan (PUK), injuring two women, a police source said. “The gunmen threw the bomb near the office of the PUK in al-Jazaer region in eastern Mosul, injuring two women,” the source told Aswat al-Iraq news agency. #3: Three policemen were injured by a roadside bomb that targeted their patrol in Mansour neighborhood in south Mosul on Monday morning. #4: An Iraqi army officer was killed by gunmen on Tuesday during a crackdown operation in western Mosul, an army source said. “An army captain was killed on Tuesday evening (Feb. 24) by unknown gunmen during a crackdown operation the army waged in al-Islah al-Zeraei neighborhood in western Mosul,” the source told Aswat al-Iraq news agency. #1: A roadside bomb on Tuesday went off in western Falluja city without causing any casualties, said a source from the Iraqi police. “The explosive charge was planted by unknown gunmen on a side road in Ijbaiyel area, western Falluja,” the source told Aswat al-Iraq news agency. “The armed men were targeting an Iraqi police patrol,” he said. #1: Afghan troops with the support of the U.S.-led Coalition forces killed 16 suspected insurgents in Taliban-hotbed Helmand province in south Afghanistan, a statement of the U.S. military released here Tuesday said. "The Afghan National Army soldiers assisted by the Coalition Forces killed 16 militants while conducting a combat reconnaissance patrol in Helmand province Monday," the statement added. The clash, it added, took place when the militants opened fire on the troops and the threat escalated, and then the combined forces responded with several precision strikes to kill the militants. MNF-Iraq is reporting the deaths of three Coalition Soldiers while conducting combat operations in an undisclosed location in Diyala Province on Monday, February 23rd. No other details were released. An interpreter was also killed. MoD hides rising injury toll of Taliban bombs: MORE than 100 British soldiers have suffered amputations and other debilitating injuries in the past year in Afghanistan, according to previously suppressed Ministry of Defence (MoD) figures that reveal the true toll of the Taliban’s roadside bombing campaign. #1: Three people, two of them soldiers, died when gunmen opened fire at an army checkpoint in Ghazaliyah, a mainly Sunni suburb of western Baghdad, a ministry official said. Eight other people were wounded. On Monday, unknown gunmen attacked an Iraqi army checkpoint in Baghdad’s western area of al-Ghazaliya, killing two servicemen and a civilian, and injuring eight persons, including four soldiers,” the source told Aswat al-Iraq news agency. #2: A roadside bomb blast targeting a police patrol near the agriculture ministry in the center of the city killed two civilians and wounded six people, the official added. Eight persons on Monday were killed or wounded in a bombing that targeted a police patrol vehicle in downtown Baghdad, according to a police source. “An improvised explosive device (IED) went off before noon while a police patrol vehicle was passing near the Ministry of Agriculture’s building on al-Nidal Street,” the source told Aswat al-Iraq news agency. “Two persons were killed, and six others were wounded, including two policemen,” the source explained. #3: On Sinaa Avenue in downtown Baghdad, a similar device also aimed at a police patrol wounded seven people, three of them policemen. Five civilians on Monday were wounded in a bomb explosion that hit downtown Baghdad, according to a police source. “A roadside improvised explosive device (IED) detonated on al-Sinaa Street, downtown Baghdad, wounding five civilians,” the source told Aswat al-Iraq news agency. #4: A roadside bomb targeted an American patrol in Ur neighborhood in northeast Baghdad around 3 p.m. No casualties reported. #1: In Iskandiriyah, a town to the south of the Iraqi capital, a man was killed and his son wounded in a bombing also targeting police. #1: Police found the body of a leader of a neighbourhood guard unit in Jurf al-Sakhar, about 60 km (40 miles) south of Baghdad, police said. The man had been handcuffed and shot in the head. #1: A car bomb killed one person and wounded another in the village of Mashru', about 65 km (40 miles) south of Baghdad, police said. #1: On Sunday night gunmen opened fire at an American at the Kornish street in downtown Kirkuk. No casualties reported. #1: U.S. and Iraqi forces have begun a new military offensive in northern Iraq aimed at rooting out al-Qaida and other Sunni insurgents, American and Iraqi officials said Sunday. The offensive - dubbed Operation New Hope - has netted 84 suspects in the provincial capital of Mosul and surrounding towns, said Iraqi Brig. Gen. Saeed Ahmed al-Jubouri. Most of the arrests occurred in Tal Abta, about 50 miles (80 kilometers) west of Mosul. #2: A sticky improvised explosive device attached to a civilian vehicle went off near the Kurdistan Democratic Party (KDP) local committee headquarters in Mosul city on Monday, a committee source said. “The IED went off about 50 meters away from the KDP local committee headquarters in al-Faisaliya neighborhood, eastern Mosul, but left no casualties,” the source told Aswat al-Iraq news agency. #3: An Iraqi army force on Monday defused a car bomb in eastern Mosul, a military source said. “A force from the 2nd division of the Iraqi army on Monday (Feb. 23) managed to defuse a booby-trapped car in al-Baath neighborhood in eastern Mosul, without casualties,” the source told Aswat al-Iraq news agency. #4: A magnetic bomb was detonated under a sedan car for a candidate of the National Iraqi list in the Jamiaa neighborhood in eastern Mosul. The candidate was wounded in that incident. #1: Two suicide bombers blew themselves up within minutes of each other Monday at an anti-drug police station in southwest Afghanistan, killing one officer and wounding two more, an official said. The first suicide attacker, wearing civilian clothes, approached the station in the southern city of Zarang at about 11 a.m., said Gov. Ghulam Dastagir Azad. When police shouted for the man to stop, he blew himself up, causing no casualties, the governor said. Minutes later, a second attacker wearing a police uniform approached the building and blew himself up, Azad said. That blast killed one officer and wounded two. #2: In the western province of Badghis, meanwhile, Taliban militants attacked a police post late Sunday, and coalition air strikes were called in, killing at least seven insurgents, said Abdul Ghani Sabery, deputy governor of Badghis. He said village elders were continuing to collect bodies from the battle site and that the toll could rise. #3: Pakistani authorities freed two Taliban fighters in exchange for an official kidnapped in Swat valley, where the government is seeking peace by offering to allow Islamic sharia law, a militant spokesman said. "We have released the official and his six guards in exchange for our two colleagues," Muslim Khan, a spokesman for the Taliban told Reuters late on Sunday. Syed Mohammad Jawed, commissioner for the Malakand division which includes Swat, confirmed the official and his guards had been freed but refused to comment on any swap. #4: "One Taliban insurgent was killed and three others made captive by ANA soldiers during an operation in Muqar district of Ghazni province on Sunday," the statements said. Iraqi electoral employees count ballot forms by lamplight during a powercut after provincial elections on January 31. Iraq has won the battle to protect its battered electricity sector from insurgents but now faces a fight to fund its way to 24-hour coverage, Electricity Minister Karim Wahid has said. Jamal al-Kilani, an official of the Iraqi Islamic Party, escapes an assassination attempt but his driver is injured in an IED attack. A man is injured by gunmen, and 3 mortar shells land on the local Iraqi army HQ. Army seizes an explosives belt. Tight security planned for pilgrims heading to Najaf for Tuesday's commemoration of the death of the Prophet. Baghdad Operations Command claims that bodyguards of MP Mohammed al-Daini have confessed to murder. Al-Daini asserts that the arrests were carried out by an extra-constitutional force controlled by Nuri al-Maliki, and that the arrests constitute terrorism. According to Al Bawaba, a warrant has now been issued for al-Daini himself. "The lawmaker, Mohammed al-Dayni, was implicated in confessions from two former bodyguards, who were detained last week, said Iraqi military spokesman Maj. Gen. Qassim al-Moussawi. Tapes of their interrogations, which were played at a news conference, contained claims that al-Dayni sanctioned attacks and raids that included killing gold merchants and looting their shops." Authorities have also implicated him in the 2007 suicide attack inside the parliament building, although no motive is stated. U.S. and Iraqi forces announce a security sweep against "al Qaeda" militants in Ninevah. The impasse has frozen debate on important measures such as Iraq's budget and regulations on foreign oil investment and sharing revenue among the nation's groups. The latest twist came when the largest Sunni political group, the Iraqi Islamic Party, asked for the nation's Supreme Court to rule on how many votes are needed: a majority of the 275-seat parliament, as the current rules say, or just most of the lawmakers casting votes. On Thursday, the candidate backed by the Islamic Party, Ayad al-Sammaraie, failed by only two votes. The appeal to the high court immediately suspended efforts for another vote and could cause an indefinite delay in the process. An operation the U.S. military at first described as a "precision strike" instead killed 13 Afghan civilians and only three militants, the U.S. said Saturday, three days after sending a general to investigate. I'm getting quite tired of this -- I have to post one of these stories every damn week . . . The additional 17,000 soldiers that the US is preparing to send to Afghanistan will face a well-armed Taliban insurgency and an unarmed but equally daunting foe: public opinion. In interviews across Kabul last week, Afghans said that instead of helping to quell the violence, more foreign forces will exacerbate the problem. The comments echoed a recent survey by the BBC and the American ABC News that found that although 90 per cent of Afghans oppose the Taliban, fewer than half view the US favourably, a sharp drop from a year ago, and a quarter say attacks on US troops can be justified. People interviewed spoke with anger and suspicion about the US-led coalition forces - questioning their motives and bitterly complaining about civilian casualties, home invasions and other alleged abuses. And, we have no way of knowing whether we should believe this. NATO coalition and Afghan troops killed at least 14 suspected militants in two attacks in southern Afghanistan, officials said Sunday. NATO troops raided a suspected militant hide-out in Kandahar province Saturday, with six suspected insurgents dying in the operation, police told CNN. And in Helmand province, a NATO air strike killed eight suspected militants who were traveling in a car, a the spokesman for the province's governor told the U.S. broadcaster. A Taliban spokesman denied the car was carrying any of its members, saying the victims were civilians. And this is also no surprise, from McClatchy's Jonathan Landay. U.S. patrol finds anger and distrust in Afghanistan. The new British battle group will consist of an infantry battalion, composed of around 700 troops, bolstered by at least one rifle company of 120 troops. The force will be supported by signallers, medics, engineers and elements of the Royal Artillery. The Army has notched up a series of major successes against the Taliban, including the retaking of Musa Qala in northern Helmand, a former insurgent stronghold, as well as the operation to create a functioning hydro-electric power station at Kajaki. But the much vaunted plans to bring reconstruction to the region have stalled, following the deterioration of security in the province. The Ministry of Defence (MoD) has now increased troops numbers in Helmand every six months since 2006, when just 3,300 troops were sent to southern Afghanistan to secure the area and to allow reconstruction to begin. John Hutton, the defence secretary, has persistently called on Britain's allies to do more of the "heavy lifting" in Afghanistan but, apart from France, virtually all have refused to do so. And, in a related issue . . .
A shocking new report alleges widespread complicity between British security agents and their Pakistani counterparts who have routinely engaged in the torture of suspects. In the study, which will be published next month by the civil liberties group Human Rights Watch, at least 10 Britons are identified who have been allegedly tortured in Pakistan and subsequently questioned by UK intelligence officials. It warns that more British cases may surface and that the issue of Pakistani terrorism suspects interrogated by British agents is likely to "run much deeper". The report will further embarrass the foreign secretary, David Miliband, who has repeatedly said the UK does not condone torture. He has been under fire for refusing to disclose US documents relating to the treatment of Guantánamo detainee and former British resident Binyam Mohamed. The documents are believed to contain evidence about the torture of Mohamed and British complicity in his maltreatment. Mohamed will return to Britain this week. Doctors who examined him in Guantánamo found evidence of prolonged physical and mental mistreatment. Ali Dayan Hasan, who led the Pakistan-based inquiry, said sources within the country's Inter-Services Intelligence agency (ISI), the Intelligence Bureau and the military security services had provided "confirmation and information" relating to British collusion in the interrogation of terrorism suspects. Hasan said the Human Rights Watch (HRW) evidence collated from Pakistan intelligence officials indicated a "systemic" modus operandi among British security services, involving a significant number of UK agents from MI5 rather than maverick elements. Different agents were deployed to interview different suspects, many of whom alleged that prior to interrogation by British officials they were tortured by Pakistani agents. Now, we are the last to be critical of oversight. The more the better. But we have to note the political overtones here. Why, during the Bush administration, didn’t the Republicans establish an “Iraq spending watch program”? Why did they not invite American troops and civilian workers over there to report their observations of waste? Why didn’t they ensure that federal agencies were undertaking preemptive initiatives to ensure accountability? Had they done so, and with the same alarmist fanfare they are now creating over emergency domestic spending, perhaps their stance on the stimulus bill would not appear so politically motivated. Untold billions were wasted in Iraq with no outcry from congressional Republicans. Now, with a bill that spends money at home amid multiple layers of transparency and accountability, the Republicans are on the hunt for any hint of abuse. Go figure. MNF-Iraq is reporting the death of a Multi-National Division - Baghdad soldier while conducting a combat patrol in an undisclosed location near Baghdad on Saturday, February 21st. The DoD is reporting a new death previously unreported by the military. PFC Cwislyn K. Walter died from a non-combat related incident in Kuwait city on Thursday, February 19th. The AFP is reporting the deaths of three U.S. led coalition soldiers in a roadside bomb attack in Uruzgan province, Afghanistan on Friday, February 20th. We are assuming these to be American soldiers. #1: Four civilians were wounded in two blasts by improvised explosive devices (IEDs) in al-Mansour area, western Baghdad, on Saturday, an Iraqi police source said. “A roadside IED went off in al-Mansour area, western Baghdad, on Saturday evening near an Iraqi army patrol, wounding two civilians,” the source told Aswat al-Iraq news agency. “Two civilians others were wounded when a second IED went off in the same area a short while after the first one,” the source added. Two gunmen on Saturday were wounded when an improvised explosive device (IED) blew up while they were planting it near Hilla city, according to a police source. “The explosive charge detonated in Jarf al-Sakhr area (60 km northwest of Hilla),” the source told Aswat al-Iraq news agency. #1: A candidate in Iraq's January 31 provincial elections was on Saturday killed by gunmen outside his house in Babil province, south of the capital Baghdad, police said. "A group of armed men killed Mohammed Hadi Layhub, a member of the Al-Umma party and a provincial elections candidate, at his house" south of Hilla, the capital of Babil, said Kadhem al-Shamari. #1: An Iraqi police source told Kuwait News Agency (KUNA) that unidentified gunmen today shot and killed an Iraqi police officer in front of his house in the area of Diwaniya, the largest city in Al-Qadsiya south of Baghdad and then ran away after that. #1: A sticky improvised explosive device (IED) on Saturday went off in downtown Tikrit city, wounding a police officer, according to a local security source. “Lt. Arkan Sabir from the Quick Response Department (QRD) in Salah al-Din province was seriously wounded when an explosive charge stuck to his vehicle blew up in al-Arbaeen St, downtown Tikrit,” the source told Aswat al-Iraq news agency. #1: An unknown corpse on Saturday was found by Iraqi army personnel near Makhmour district, according to a military source. “Today, an army force found a body of a man in his thirties on the main road linking Makhmour district to al-Qayara district near Diyozanti village (28 km west of Makhmour),” the source told Aswat al-Iraq news agency.“The body bore gunshot wounds,” the source noted, adding that an investigation is currently underway to reveal the motivations behind the murder. #1: A roadside bomb wounded an Iraqi soldier when it struck a patrol southwest of Kirkuk, 250 km (155 miles) north of Baghdad, police said. #1: An Iraqi serviceman on Saturday was wounded when an improvised explosive device (IED) targeted his patrol vehicle in Mosul city, according to a local security source. “The explosion occurred in Sumor neighborhood, southeastern Mosul,” the source told Aswat al-Iraq news agency. #1: Helicopter gunships and artillery targeted several militant locations overnight in Bajaur tribal district, where Pakistani security forces are fighting Taliban and Al Qaeda fighters. The action that started late Friday continued Saturday morning. “Our forces have destroyed some important hideouts of militants and killed some 25 insurgents, including a commander Faizullah,” said a security official from paramilitary troops Bajaur Scouts. #2: In the neighbouring Khyber tribal region, a remote-controlled bomb planted along Pak-Afghan Highway destroyed a tanker carrying fuel supplies for NATO forces. “One bypasser was killed and two more injured, while the driver remained unhurt,” said a local official, Amirzada Khan. #3: Separately, sectarian tensions in Dera Ismail Khan district, which borders ungoverned tribal region, intensified a day after a suicide bombing at Shia funeral procession killed 35 people and injured more than 150. Unknown gunmen opened fire on a group of Sunni Muslims in a market, leaving two of them dead and three more injured, said a police officer, Amanullah Khan. #4: In another incident, two suspected terrorists were killed when their explosive-laden car exploded pre-maturely in Lucky Marwat area, which is adjacent to Dera Ismail Khan. #5: Militants shot dead a policeman after accusing him of being U.S. spy and left his body by the roadside near the Afghan border on Saturday, a government official in North Waziristan tribal region said. #6: Afghan police guarding a World Food Programme convoy killed three insurgents and wounded two more after they were ambushed in the Khash Rud district of Nimroz province, some 675 km (420 miles) southwest of Kabul, the Interior Ministry said. #7: Two road construction workers were killed in a mine explosion in Ghazni province, some 130 km (80 miles) southwest of Kabul, the Defence Ministry said. #8: Two soldiers of Afghan National Army (ANA) were killed and four others sustained injures when their vehicle hit by a roadside bomb in Afghanistan's eastern Khost province, an official said Saturday. "The incident occurred in the Sabari district on Friday, as a result two soldiers were killed and four others got wounded," Provincial Police Chief Abdul Qayum Baqizai told Xinhua. Capt. Joe Bogart, morning of Oct. 6, 2006 the Army's Fifth Engineer Battalion was clearing roadside bombs in Baghdad when the convoy was hit. An explosion four feet from Bogart's command vehicle sent shrapnel shooting into his head. He lost his right eye. He suffered brain damage and severe facial fractures. Army Pfc. Daryl Pelland, 19, was seriously wounded in an Iraq bombing last month. He was wounded Jan. 24 when a remote controlled bomb exploded near the Humvee in which he was riding south of Baghdad. Pelland and two other soldiers were wounded. Pelland was flown to Walter Reed Army Hospital in Washington, D.C., where he is recovering from wounds to his left leg and foot.Pelland, a gunner, is a member of the Army's 77th Field Artillery. "We were the last vehicle in the convoy, and there was an explosion," Pelland said. "Three of us were hit." Pelland has had multiple surgeries to remove shrapnel from his leg and thigh. A nerve in his calf was also damaged. Kyrgyzstan hands U.S. air base eviction notice: Kyrgyzstan's Foreign Ministry said on Friday it had sent the United States ambassador a formal notice demanding Washington close its military air base in the country and giving U.S. troops 180 days to pack up and leave. US: Kyrgyz base not 'closed issue': U.S. Defense Secretary Robert Gates says Kyrgyzstan's decision to shutter an American air base is not a "closed issue." Debt is a target on U.S. military radar: Military personnel with outstanding legal debts are barred from overseas duty or security clearances, which keeps thousands of U.S. troops from doing their jobs. So the Pentagon is tackling the problem. Nancy Marshall Genzer reports. GIs are back, but at a loss: A survey of soldiers returning from Iraq found that as many as 1 in 4 had some level of hearing damage. A study in the American Journal of Audiology found that soldiers deployed to Iraq from April 2003 to March 2004 were 50 times more likely to suffer acoustic trauma than those who were not deployed. #1: An Iraqi soldier was shot and wounded by sniper fire in Baghdad's western district of Mansour, police said. #1: An Iraqi soldier was killed in downtown Baquba city north of Baghdad around 7 p.m. by an adhesive bomb which was stuck to his car. #1: Police forces on Friday found an unknown body in a house in south of Hilla city, a police source said. “Policemen found an unidentified body in a house in al-Hamza al-Gharbi region in south of Hilla,” the source told Aswat al-Iraq news agency. “The decayed body bore signs of gunshot wounds,” he noted. #1: Three shepherds were killed when a landmine left from the 1980-1989 Iraqi-Iranian war went-off in eastern Wassit on Friday, a security source from the province said. “The incident took place at Jasan district, 65 km east of Kut city,” the source told Aswat al-Iraq news agency. #1: A civilian was killed by unknown gunmen on Friday in northern Babel, a police source said. “Unidentified gunmen killed a civilian in front of his house in al-Latifiya region in north of Hilla,” the source told Aswat al-Iraq news agency. #1: A woman and two children were killed on Thursday in two explosions outside a home near Abu Ghraib, on Baghdad's western outskirts, the U.S. military statement said. Two men were injured. #1: A magnetic bomb detonated under a policeman’s car in Zedan’s neighborhood in eastern Fallujah. Two people were killed (the policeman’s father and wife) and he was wounded in that incident. #1: A bomb tore through a funeral procession for a slain Shiite Muslim leader in northwestern Pakistan on Friday, killing at least 25 people and wounding scores more, officials said. Friday's explosion struck a 1,000-strong crowd streaming toward a graveyard in Dera Ismail Khan for the burial of Sher Zeman, a Shiite leader who was gunned down in the city the day before. Ashiq Salim, a doctor at the main hospital in the city of Dera Ismail Khan, said 25 bodies had been brought there and that medics were scrambling to treat another 60 people who were wounded. Police said people angered by the attack fired on officers rushing to the scene, where TV footage showed a bloodstained street littered with shoes and torn clothing. #2: Five soldiers were wounded when a grenade accidentally exploded at the Danish military headquarters in southern Afghanistan yesterday. A statement from the armed forces last night said that the one of the soldiers sustained serious wounds, while the other four were slightly hurt by grenade fragments. The explosion occurred at Camp Bastion in the Helmand Province after the soldiers had returned from their assignment. They were unpacking their equipment when the grenade went off near the ramp of an armoured vehicle. #3: One Afghan was injured in an escalation of force incident near Kabul, Wednesday. An International Security Assistance Force (ISAF) convoy encountered an oncoming vehicle that failed to halt despite repeated measures to warn and deter the vehicle’s approach. After several nonlethal attempts, the convoy fired a series of disabling shots to halt the vehicle’s progress, causing the driver to pull over. Kyrgyzstan parliament votes to close key U.S. air base: Deputies voted 78-1 for the government-backed bill to cancel the lease agreement on the Manas air base, a transit point for 15,000 troops and 500 tons of cargo each month to and from Afghanistan. Two deputies abstained. If President Kurmanbek Bakiyev signs the bill and Kyrgyz authorities issue an eviction notice, the United States will have 180 days to vacate the base. #1: A roadside bomb detonated in Karadat Mariam neighborhood in downtown Baghdad around 1 p.m. Three people were injured. #2: A roadside bomb targeted the convoy of Adel Abdul Mahdi’s guards near the Masbah intersection in Karrada neighborhood in downtown Baghdad around 1:30 p.m. Eight people were wounded including four guards. #3: Four civilians were wounded on Thursday in a bomb explosion in central Baghdad, the spokesman for the Baghdad Operations Command said. “A locally-made bomb, left by unknown man near a popular restaurant in al-Salihiya region in central Baghdad, went off, injuring four civilians,” the source told Aswat al-Iraq news agency. #1: An Iraqi army soldier killed three of his colleagues and then committed suicide at a checkpoint to the south of Baaquba city, said a security source from Diala province’s police. “The soldier belongs to the Iraqi army 1st division,” the source told Aswat al-Iraq news agency. “He was stationed at a checkpoint in al-Abara area of Bohroz district, 5 km south of Baaquba, where the incident took place,” he said. “The serviceman was hysterical when he committed this act,” he added. #1: Four Iraqi soldiers were killed and two were injured when a roadside bomb exploded in the restive province of Diyala on Thursday, a senior police officer told AFP. The attack took place in Balad Ruz, a town 70 kilometres (44 miles) northeast of Baghdad, said the officer, who asked not to be named. "Four Iraqi soldiers were killed and two others wounded when a roadside bomb targetted their patrol," he said. #1: Iraqi army forces on Thursday found three bodies in a mass grave in a village in the south of Baaquba, an army source said. “Iraqi army forces found a mass grave containing three unidentified bodies in Abu Seif village in Bani Saad district in south of Baaquba,” Colonel Ali Mahmoud Mutaaeb told Aswat al-Iraq news agency. "The bodies, belong to three civilians, bore signs of gunshot wounds to the head and different parts of the body,” he added. #1: A total of 14 unknown bodies were buried in a cemetery in Kirkuk on Thursday morning, a member of the Kirkuk provincial council said. “A specialized committee in Kirkuk started Thursday morning (Feb. 19) buring 14 unknown bodies, all males, in a cemetery in Naja Ali region in south of Kirkuk,” Jawad al-Janabi told Aswat al-Iraq news agency. “They bodies spent more than 6 months in the morgue,” he noted. #1: A policeman was killed and five people were wounded in a suicide car bomb explosion in southern Mosul, a security source said on Thursday. “A suicide bomber blew up a car crammed with explosives on Thursday morning (Feb. 19) targeting a police vehicle patrol in Wadi Hagar region in southern Mosul, killing one policeman and injuring five, including three civilians,” the source told Aswat al-Iraq news agency. “Police found the remains of a body believed to belong to the attacker inside the car,” he added. #2: An off-duty Iraqi soldier was shot dead in central Mosul, police said. #3: A policeman was killed when a roadside bomb exploded near a police patrol in western Mosul, 390 km (240 miles) north of Baghdad, police said. #4: Gunmen killed the owner of a shop in western Mosul, police said. #5: Gunmen killed a man and stole his car in central Mosul, police said. #6: A policeman was wounded when a roadside bomb exploded near a police patrol in western Mosul, police said. #7: A roadside bomb wounded a civilian when it exploded near a police patrol in Mosul, police said. #8: A combined force of the Iraqi army and police on Thursday defused a car bomb in eastern Mosul, said a security source from Ninewa province’s police. “The booby-trapped car was parked in al-Methaq neighborhood, eastern Mosul,” the source told Aswat al-Iraq news agency. “The car bomb was defused without any casualties,” he said. #1: A roadside bomb near a police station killed a policeman and wounded one person in the town of Garma, 30 km (20 miles) northwest of Baghdad, police said. #1: Gunmen killed a Pakistani television reporter Wednesday hours after he covered a peace march led by a hard-line cleric aimed at convincing militants in the Swat Valley to lay down their weapons under a pact with the government, the victim's employer said. It was unclear who shot Geo television's Musa Khan Khel. Khel's body was found close to the town of Matta several hours after he had left the rest of his crew without telling them where he was going, said Azhar Abbas, the managing director of Geo, Pakistan's most popular news channel. He had been shot several times in his upper body, and his throat was partly slit, Abbas said, refusing to speculate on a motive for the crime. #2: A bomb planted by insurgents struck the car of an Indian engineer in Khost province east of Afghanistan Thursday, killing a local guard and wounding two others including the engineer, police said. "The gruesome incident occurred in Dumanda district on Khost--Gerdez highway at 12:30 p.m. local time, as a result the Indian engineer along with one of his guards were injured and another guard was killed," provincial police chief Abdul Qayum Baqizoi told Xinhua. He further added that the Indian engineer works for a road construction company involved in building roads in east Afghanistan. #3: A would-be suicide bomber who was trying to target a US military convoy in Kabul was arrested by Afghan security forces. The would-be bomber was arrested in the Company area, located on western outskirts of Kabul city, on Wednesday as he was trying to target a convoy of US military forces which was passing by the area, the Interior Ministry said in a statement. The man was driving a Toyota Surf vehicle, loaded with 170 kilograms of explosive, two cylinders filled with ten kilograms of gas and three litres of petrol, the statement said. #4: Meanwhile, three militants were killed in Kajaki district of the southern province of Helmand on Wednesday when a bomb they were trying to plant on a road in the district exploded prematurely, an Interior Ministry statement said. #5: Separately, four insurgents were killed in a fight with Afghan army forces in Panjwayee district of the southern province of Kandahar on Wednesday, the Defence Ministry said in a statement. Army forces seized ten tractors that Taliban insurgents had stolen from local villagers in the province, it said, adding that the militants were using the tractors to dig tunnels and build military fortifications. #6: Three guards hired by NATO security forces were shot dead Thursday. It was not clear who shot the three men working for NATO security forces in the eastern province of Khost, provincial government spokesman Kuchai Nasiri said. #7: Also in Khost, a boys' school was torched overnight, provincial education director Sayed Musa Majroh said, blaming the attack on Taliban, who are said to have destroyed scores of schools in this manner. Iran says it has built unmanned aircraft: A top Iranian defense official says the country has built an unmanned surveillance aircraft with a range of more than 600 miles. Italy to send more troops to Afghanistan: Italy is ready to increase its military force in Afghanistan by about 500 to nearly 3,000 troops, Foreign Minister Franco Frattini said on Wednesday. #1: Gunmen in a car shot dead an official of a Sunni Arab party in front of his Baghdad home on Wednesday, a colleague in the Iraqi Islamic Party said. Samir Safwat, a 55-year-old Trade Ministry employee, was gunned down in the southern district of Zafraniyah, said lawmaker Omar Abdel Sattar, adding that the assailants fled. #2: A gunman shot an RPG missile at a military barracks located in an unoccupied school in Sadr city, northeastern Baghdad at 9 p.m. Tuesday killing one soldier and injuring four others. #1: An Iraqi military official says a bus carrying Shiite pilgrims has collided with a British military vehicle on the outskirts of Basra, killing seven of the travelers. Maj. Gen. Mohammed Jawad Huwaidi says 27 pilgrims were injured in the accident late Tuesday night. Huwaidi, the top military official in Basra, says the pilgrims were coming from the Shiite holy city of Karbala. A British Defense Ministry spokesman says the military vehicle was on a routine night patrol outside Basra when a bus drove into the back of it. #1: Major-General Salahuddin Rasheed, commander of an Iraqi military division, was lightly wounded when a roadside bomb struck his convoy just south of Tikrit, 150 km (95 miles) north of Baghdad, said Mohammed Anwar, a police captain in Tikrit. Five of the officer's bodyguards were also wounded. #1: An explosive charge exploded on Wednesday (Feb. 18) near a cotton ginnery on the Kirkuk-Baghdad road on southwest of Kirkuk while a police vehicle patrol was passing,” Colonel Kamel Ahmed told Aswat al-Iraq news agency.“The explosion left no casualties but destroyed a military vehicle,” he added. #2: Another bomb exploded near the same region, without casualties,” he also said. #1: One Christian civilian on Tuesday was killed when he came under fire by unknown gunmen’ in al-Midan neighborhood, Mosul city, according to a reliable source. “The victim was targeted by unidentified armed men near to the location of his work,” the source told Aswat al-Iraq news agency. The source explained that the deceased victim was with his colleague when they both came under gunmen’s fire, and that the other victim was wounded and is currently in critical and unstable condition at hospital. #2: An Iraqi soldier was wounded on Tuesday in a bomb explosion in eastern Mosul city, an Iraqi army source said. “An improvised explosive device went off on Tuesday (Feb. 17) targeting Iraqi army vehicles patrols of the 3rd brigade in al-Tahrir neighborhood in eastern Mosul, injuring a soldier,” the source told Aswat al-Iraq news agency. #3: A policeman was injured on Tuesday in a sticky bomb explosion in south of Mosul, according t a police source. “An improvised explosive device stuck to a private car, went off in Hamam al-Aleel district in south of Mosul,” the source told Aswat al-Iraq news agency. “The explosion led to cutting off one of the cop’s legs,” he added. #4: A civilian was killed on Tuesday by unknown gunmen in west of Mosul city, a police source said. “Unknown gunmen shot and killed a civilian on Tuesday (Feb. 17) at the center of a market in Tal Abta district in west of Mosul,” the source told Aswat al-Iraq news agency. He gave no further details. #5: A policeman was killed on Wednesday in a roadside bomb explosion in western Mosul, a police source said. “An improvised explosive device went off Wednesday (Feb. 18) targeting a police vehicle patrol in Souq al-Maash region in western Mosul, killing a policeman and damaging the vehicle,” the source told Aswat al-Iraq news agency. #1: Taliban-led insurgents fighting the Afghan government set on fire a school and one clinic in eastern Afghanistan, officials said Wednesday. The militia in the first attack raided a primary school in Gobuz district of Khost province late last night, setting it ablaze and destroyed it, the police chief of the district, Bismillah Khan told Xinhua. #2: Militants also burned a health clinic in Watapor district of Kunar province, a health official in the province Assadullah told Xinhua. The building, constructed recently, was burnt to rubble, he official further said. #3: provincial spokesman said Wednesday that Taliban militants killed two male students for greeting a group of NATO soldiers in central Afghanistan, but the rebel website said they were executed for spying. Ahmad Khalid, 20, and Eid Gul, 19, students at a high school in Sayed Abad district of the central province of Wardak, greeted a group of NATO soldiers passing by their village in a convoy, according to Adam Khan Serat, spokesman for the provincial governor. 'The boys only greeted the foreign soldiers and spoke a few words in English with them,' Serat said. 'The Taliban militants later came and took the boys to an unknown location.' Their bodies were dumped near their homes in Sangi village, he said. #4: U.S. forces killed at least one child, video footage obtained by Reuters on Wednesday showed, in an air strike in western Afghanistan that police say killed 12 civilians and U.S. forces said killed 16 militants. Video taken in the Gozara district of Herat province in the aftermath of the attack on Monday showed mangled, unrecognisable clumps of flesh -- all that remained of several people and dozens of animals killed in a tented nomad encampment. One body that was recognisable was that of a young boy. "The information we have is 12 civilians, including six women, four men and two children have been killed in the bombardment," General Ikramuddin Yawar, chief of police in western Afghanistan told Reuters. The Afghan Defence Ministry said "seven terrorists" were among "several civilians" killed in the strike. The British MoD is reporting the death of a British ISAF soldier from enemy fire south of Lashkar Gah, in the Nawa district, Helmand province, Afghanistan on Monday, February 16th. Here's the NATO statement. #1: A Sahwa council fighter on Tuesday was wounded when an improvised explosive device (IED) went off in northern Baghdad, according to a security source. “A roadside explosive charge planted by unknown men in Baghdad’s northern area of al-Adhamiya detonated while a vehicle belonging to the Sahwa councils was passing the location, wounding one fighter,” the source told Aswat al-Iraq news agency. #1: Three policemen on Tuesday were killed and seven others were wounded in a blast that ripped through downtown Baaquba city, according to a security source. “An improvised explosive device (IED) detonated inside a popular restaurant in front of Diala’s police department in downtown Baaquba city, killing three cops and wounding seven others,” the source told Aswat al-Iraq news agency. Two successive roadside bombs killed two civilians and wounded another 10, including six policemen, in central Baquba, 65 km (40 miles) northeast of Baghdad, police said. The first bomb targeted a roadside food stand where police were eating. The second exploded as fellow police rushed to the scene. #2: Two children on Tuesday were wounded when an improvised explosive device (IED) went off near Baaquba city, according to a security source. “The device detonated in Hamreen village (13 km north of al-Saadiya district), injuring two kids,” the source told Aswat al-Iraq news agency. “The children are eight and 10 years old,” the source added, providing no further details. #1: An Iraqi police colonel on Tuesday survived as assassination attempt in Diala’s al-Khales district, according to an official source. “Today, an improvised explosive device (IED) detonated near a checkpoint set up at the entrance of al-Khales district (15 km north of Baaquba) targeting Col. Hamid al-Luhaibi while he was heading home to al-Aswad area,” the source told Aswat al-Iraq news agency.“There has been no word on casualties,” the source added. #1: Security forces defused two roadside bombs in al-Refaee suburb, southern Thi-Qar province, according to a release issued by Thi-Qar police directorate on Tuesday. “The two explosive charges were planted on a road that links Nassiriya city to al-Refaee suburb (80 km south of the city),” said the release that was received by Aswat al-Iraq news agency. #1: A roadside bomb planted behind a caravan belonging to the Support Forces HQ in Siniyah district, 5 km to the west of the city of Baiji detonated, Monday evening killing three members of the Support Forces, injuring three others. #1: A car bomb exploded on Tuesday outside the home of a town councillor critical of militants in northwestern Pakistan, killing three people and wounding eight, police officials said. The device detonated near a room used by Fahim-ur-Rehman to entertain guests in the suburban town of Bazidkhel, just outside the sprawling city of Peshawar, the officials said. #2: Afghan and NATO-led troops detained two insurgents in an operation in Tirzaye district, 150 km (95) miles east of Kabul. The suspects were involved in a suicide car bombing that killed two U.S. soldiers in Khost 0n Feb 10, a statement by NATO-led forces said. #3: U.S.-led coalition and Afghan troops killed five militants in an operation targeting an arms supplier in the Qala Gah district, some 635 km (395) miles southwest of Kabul, the U.S. said. #4: Air raids against rebels' hideout in west Afghanistan claimed the lives of five armed insurgents and wounded 18 others including women and children, a district chief said Tuesday. "These raids carried out against Ghulam Yahya Khan, a rebel commander, in Karizmir village of Gazara district Monday night, killing five armed men and injuring 18 civilians including five women and five children," Alim Khan the district chief of Guzara told Xinhua.